To be complete, your application must include at least two essays. All applicants must submit Topic C and a second essay in response to A, B, D (required for some majors) or S.
Describe a setting in which you have collaborated or interacted with people whose experiences and/or beliefs differ from yours. Address your initial feelings and how those feelings were or were not changed by this experience. Submit this essay if you are applying to architecture, art history, design, studio art, or visual art studies/art education. If you’re interested in checking out the new ApplyTexas essay prompts, please click here. As always, we’re here to help, so let us know if you need some guidance on these new essays! Everyone is so busy these days! We understand that not everyone has the time to read countless articles, books, blogs, Facebook posts, and tweets to stay informed about changes in college admissions. That is why we are excited to launch a new series of short videos sharing our best tips and tricks designed to give you the info that you need in a quick and easy way. Our first video is below and offers some insight into applying for the Engineering program at UT! We’ll be adding more videos throughout the summer and sharing them via Facebook and Twitter as well as here on our blog and we hope that you will find them informative and more interesting than your standard college admissions fare. If you have a topic or question you’d like us to address, please send us a note at info@allinoneacademics.com and we will try to turn it into a video for you and everyone else who has been wondering about the same thing. Join us next Wednesday for a reception and book signing featuring Jessica Givens, author and college admissions expert, as she again delivers her engaging and informative “Five Secrets to College Admissions Gold” presentation. She will also be available to discuss her book, Get Your Summer Strategy On, as well as the just released Texas College Application Toolkit. We hope you’ll join us! Space is limited so please RSVP by sending an email to may@allinoneacademics.com or by calling 713.405.1193. Refreshments and snacks will be provided from L’Olivier. Introducing our Texas College Application Toolkit! 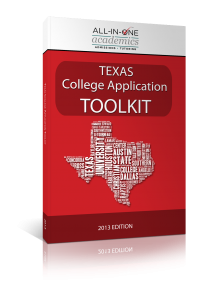 We are excited to announce that we’ve just released a new workbook: The Texas College Application Toolkit! This isn’t just a college application workbook.. it is a full toolkit because the book’s content is enhanced by a series of web-based lessons and videos designed to bring the information to life. This toolkit allows students to explore all of the options they have for secondary education in the state of Texas and breaks it down into short, informative lessons. From explaining the meaning of key college application terms, to the differences between the SAT and ACT or what questions to ask yourself when composing the essays of the ApplyTexas Application, this toolkit has everything a student needs to be informed and empowered to take charge of their educational future. The workbook is now available for pre-order on our website at www.allinoneacademics.com/appworkbook. Once the workbook has been delivered, it contains instructions on how to access the interactive components on the web. We are so excited to be able to offer all of this information to the students of Texas and hope that they are able to make more educated decisions as they begin and eventually complete the college applications process. 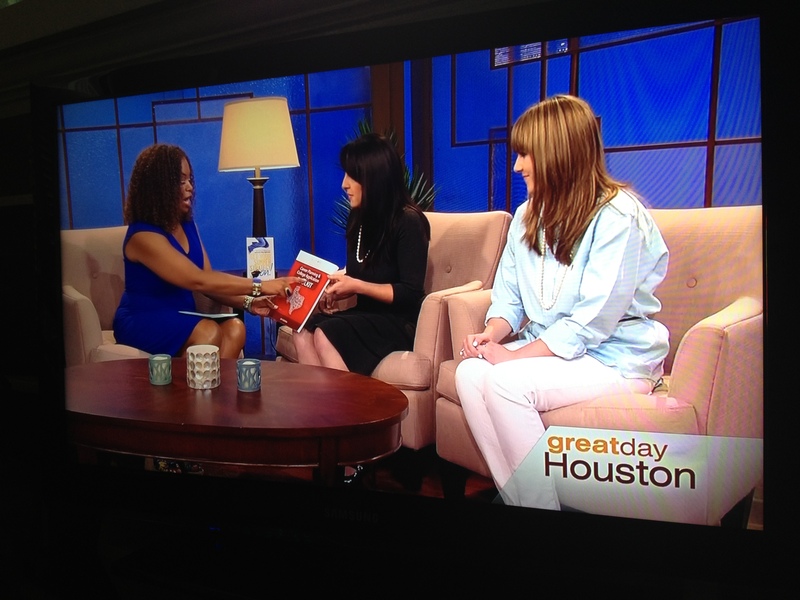 Jessica Givens sharing the Texas College Application Toolkit on KHOU's Great Day Houston! Attention 8-11th grade students and their parents! Nottingham Forest Club is hosting our President, Jessica Givens, college admissions expert and acclaimed author of Get Your Summer Strategy On for an exclusive college admissions information session. Jessica will be delivering her engaging and informative presentation Five Secrets to College Admissions Gold at an information session from 12:00pm until 1:00pm on Saturday, April 20th at The Nottingham Forest Club. The Information Session will also include a discussion about our upcoming College Application Crash Courses for high school juniors. And, we’ll have gelato! Too many parents, students and counselors are operating with out-dated assumptions about what works and are blind-sided by often-avoidable rejection letters. Join us to learn about how to navigate the ever-changing college admissions process and to socialize with your neighbors. This session is geared toward parents of students between eighth and eleventh grade but anyone is welcome. Please join us! To RSVP, please send an email to may@allinoneacademics.com or call 713.405.1193. Upcoming Information Session: All About Our College Application Crash Courses in Spain! Previews for Texas college applications are released as early as April, so let’s write those essays and build those résumés over the summer! All-in-OneAcademics’ Crash Courses are the gold standard for college application assistance, and now that we’ve partnered with Sol Abroad, students can participate in a Crash Course with top college application experts AND study abroad in Spain. To learn more about how students can prepare compelling college applications or study for the SAT and ACT this summer in Granada, Spain, please join us for an information session at The Houstonian Club. All-in-OneAcademics president, Jessica Givens, and Sol Abroad president, Brent Hunter, will personally give you the details on this exciting opportunity, as well as answer any questions you may have. College Application Crash Courses in Spain! Space is limited to 30 guests. Please ask the guard at the gate for directions. We hope to see you there! In the meantime, check out this short video about the program! Summer will be here before you know it – and for juniors in high school, that means it’s time to get serious about planning for the college application process. One way to get ahead of the curve is to sign up for one of our College Application Crash Courses – an intensive week-long workshop intended to provide expert guidance to students as they complete the written components of their college applications – all before senior year even starts! But don’t take it from us – take it from a student who took part in one of our sessions last summer and is now finishing up senior year and preparing to head off to Philadelphia to join Penn’s class of 2017! The following is an excerpt from Julian answering questions about his experience last summer with instructors Jessica and Jamil. – What did you think was the most helpful part of the crash course? The most helpful part of the crash course was the help that we received with the infamous common app essays. They are simple questions, but such simplicity clutters the thoughts and responses of nervous applicants. Jessica and Jamil were able to guide us through the process, and when we did not know where to start, they helped us brainstorm ideas of what to write. Although many of us did go through several drafts and changes, we were able to produce admissions-worthy essays. – Do you think your applications would have turned out differently if you were not part of a crash course? How? If it weren’t for the crash course, I can see my application lacking strength and personality. My school, KIPP Houston High School, does a pretty good job informing us on the college process. However, it does not compare to the amount of help Jessica and Jamil provided us with. It definitely boosted my confidence level, and since many universities do not see you in person during the review process, the crash course was able to help me implement my personality, morals, and stories necessary for universities to know and understand. – What would you tell a student who is thinking about taking a crash course next summer? If I could give any advice, I would tell them to be prepared. In other words, the crash course had me working the entire day, and I would advise a prospective participant to be ready for all the hard work that Jessica and Jamil put you through. It is non-stop work with filling out the meticulous common app, and it’s even more strenuous working through revision after revision on the essays. In the end, however, it is definitely worth the hard work. When all your friends and stressing over the college process, you could sit back because you got it done and revised over the summer. Thank you to Julian for providing us with information about his experience last summer and best of luck when you start at Penn in the fall! For more information about our Crash Courses, please click here. Announcing our SAT/ACT and College Application Study Abroad Program! This summer, we’ll be offering our Elite SAT/ACT Prep Course and our College Application Crash Courses as part of a study abroad program in Spain! We’ve partnered with Sol Abroad, a leader in Spanish immersion programs in Texas – to offer our SAT/ACT Prep Courses and our College Application Crash Courses as an add-on to their fantastic program running this summer in Granada. This program includes orientation, tuition and classes, excursions, cultural activities, housing, meals, and more. For more information, or to sign up, please visit www.allinoneacademics.com/spain. 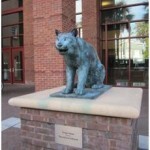 For more information about Sol Abroad, visit their website at www.solabroad.com. We hope you’ll join us for this amazing opportunity! We had heard about College of Charleston for years, and with the rising number of students in our program seeking cool, out-of-state public schools, we decided to take a look in person. 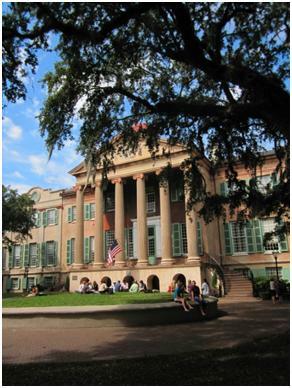 Here’s what we found: College of Charleston merits serious consideration. 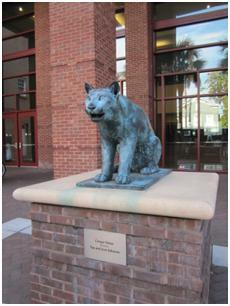 College of Charleston is a liberal arts college. As such, it offers a wide array of majors, including business, but all majors require a core set of classes from a variety of disciplines. 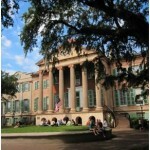 At the same time, College of Charleston has a few unique majors that some kids might want to consider. The Arts Management program is second-to-none, with students getting behind-the-scenes experience in the arenas of nonprofit and gallery work. Students have a set of well-connected professors who help them score internships at museums, galleries, and festivals, so students graduate with the experience to go out and get real jobs in the industry. Additionally, the Historic Preservation major is for students who want to learn how to maintain historical architecture and art. 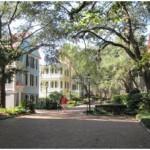 It’s a wonderful program, especially in Charleston, because of the antebellum and turn-of-the century homes in the Battery. Finally, the Hospitality and Tourism major is excellent, not only because of the tremendous faculty, but also because of Charleston’s great touristic value. This school contrasts with Houston’s Conrad Hilton School of Hotel and Restaurant Management because the exposure is so different; Charleston has far more leisure tourists, while Houston has many corporate travelers, just in town for business. As a result, students who hope to work in the resort industry would likely find greater opportunities here, considering that Kiawah and Hilton Head are so close by. With respect to social life, there is a small Greek life – about 19%. 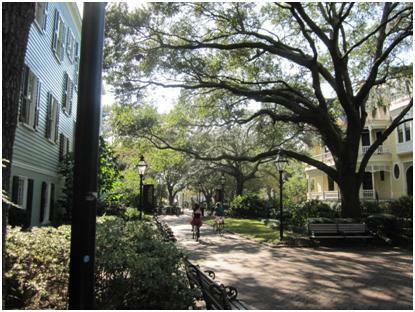 Students not participating in sororities and fraternities enjoy multiple cultural and social opportunities, more so than at many other public colleges, primarily because of the location in Charleston – this place is just fun, and the city itself just breathes good times. 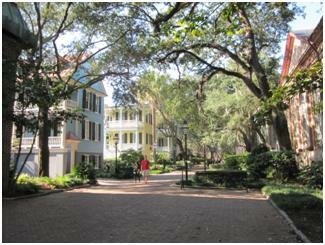 Housing is interesting because aside from the standard freshman dorms, Charleston also has a collection of historic homes on campus where students live. Theme-based housing, such as gender studies or foreign language or the Medical Manor, is located within these gorgeous old homes, and although they’re probably rickety, they are amazing places for college kids to call home. Many kids also live off-campus, and we visited one of our students at his off-campus home. It was beautiful, and all he had to do to get to school was jump on his bike. The streets are safe and slow, and it would be a crime not to ride here – besides, it makes parking issues evaporate. For our students who need accommodations for learning differences, Charleston can take care of most issues. They have a program called SNAP (no one can really put a finger on what the acronym stands for), which works with students who need extended time or notetaking or textbook accommodations. Also, in the Center for Student learning, students will find tutoring labs in every area, and if they don’t have a tutor in the subject you need, they will find one! It’s pretty awesome. Now for the nitty-gritty: getting in. Charleston is getting more competitive, but the test score ranges are still doable. The average ACT score range for out-of-state students is 24-28. The average range for SAT Math and Critical Reading is 1100-1240. However, test scores don’t carry the highest weight here; grades and academic rigor are far more important. That means you should stick with those harder classes and put your nose to the grindstone. The truth is (always) that it’s better to aim for A’s than to strive for the cheerleading squad. And, if your numbers fall on the lower side, you should definitely fill out the optional personal statement. Yes, it is optional – but I make all of my students do it. Why? Well, because it’s a poor choice to forgo any chance you have to show your merit. Charleston is beautiful, low-key, and classy. I’m a clear supporter of the school because I think it’s big enough that you can see a new face every day, but small enough that you can get to know faculty members. I like the internship requirements here because it’s becoming more and more obvious that students without internships have a very hard time finding work in the long run. 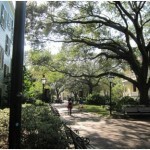 However, Charleston doesn’t offer every major, a fact they readily admit. So, if you’re committed to engineering, this isn’t your spot. And, if fashion management or merchandising or design is in the cards for you, then look elsewhere. The reps here will be completely honest if they feel like your needs will be better met at a different college, so call them and ask before you invest time and energy in a visit or application. What you study is far more important than where you study (unless we’re talking Ivies or Stanford), so get your ducks in a row before making a decision.